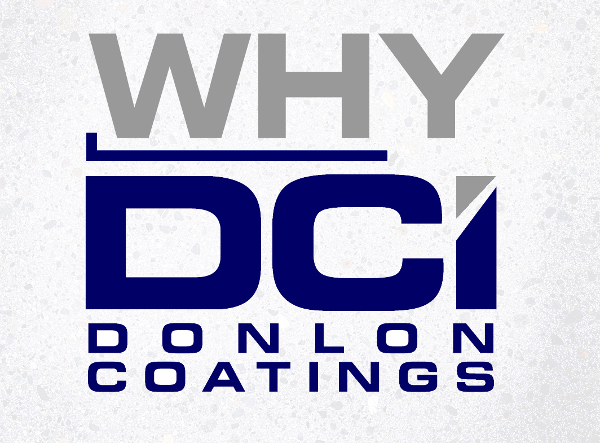 Projects - Donlon Coatings, Inc.
At the kitchen areas we installed a premium urethane mortar floor system from Dur-A-Flex. This floor coating system is designed to withstand harsh cleaners and hot water washdowns while completely and seamlessly sealing the floor beneath. We installed integral epoxy cove base to make the floor a virtual sink, containing the wash so that is can be directed to the drains. The customer wanted the dining areas and restrooms to have a variegated natural appearance however the existing concrete was not a good candidate for that finish. This floor was severely cracked and movement from street traffic was a potential issue. We installed a flexible membrane including an embedded fiberglass blanket with flexible epoxy. We then installed a polymer concrete system which we subsequently dyed in 3 colors and polished. We protected it with urethane in the restrooms and polish guard in the dining areas. These were 2 projects, a marijuana dispensary and a separate grow facility, that were new buildings in 2018. At the dispensary customer area we installed a variegated color effect epoxy coating known as metallic epoxy. This floor coating system included a moisture mitigation primer. Mitigation is always required on concrete that is relatively new. The top coat is a clear aliphatic urethane that can be washed thousands of times without wearing. The grow facility was mostly coated with a urethane mortar, 118th inch thick with sand for non-slip. This floor coating system was sealed with epoxy and aliphatic urethane. These resinous floors also have integral epoxy cove base installed with the floor which protects the walls from water and contains water from washings.